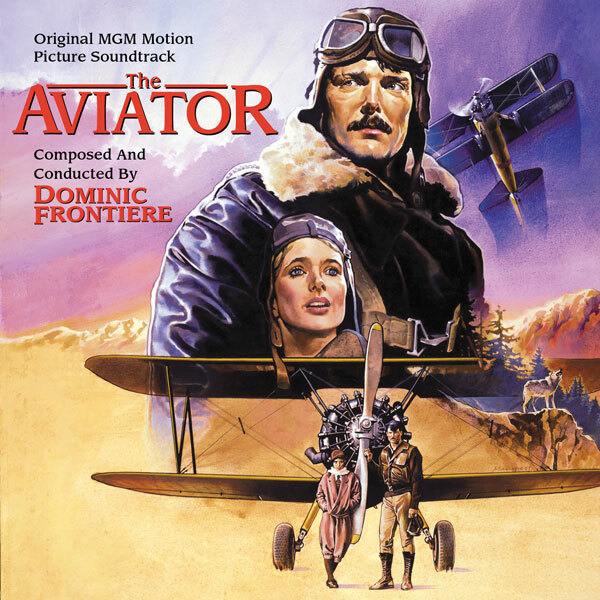 In 1985, composer Dominic Frontiere composed a large, soaring symphonic score for MGM's The Aviator. In a year filled with symphonic splendor, including Back to the Future, Silverado, Explorers, Rambo II, The Goonies, Return to Oz, The Black Cauldron... a seemingly endless bounty of stunning scores, it was easy for the magnificent score to The Aviator to get lost. Frontiere's score is designed around two major themes: one for Edgar (played by Christopher Reeve) and and one for Tillie (Rosana Arquette). Edgar's theme is all about flight -- its beauty and nobility. It's an aptly old-fashioned, symphonic tune played with unabashed sentiment by the Munich Symphony Orchestra. It’s a movie theme that harkens back to the “Golden Age” of cinema, with its liquid slurs and high, expressive string phrasing. Tillie's theme is similarly old-fashioned, endowing the young flapper with a sense of innocent romance and fragile beauty. This release of The Aviator features a number of important distinctions from all previous releases of the music. It was originally available on vinyl and later on a slightly expanded CD. Both of these prior versions not only omitted a significant number of cues from the score but, interestingly, did not include the separately recorded percussion tracks for several sequences. This fully restored release features every track Frontiere recorded during his Munich scoring sessions—including the separate percussion overlays which are mixed as the composer intended. Including several alternates in “the extras” section of the disc plus the composer’s source cues, this new Intrada CD presents 75 minutes of music in all. In the film, Reeve plays Anscombe, a veteran mail pilot in 1920s Nevada. His boss (Jack Warden) tasks him with carrying a passenger to Boise—Tillie (Arquette), the gabby daughter of a wealthy banker who owns most of the route’s airplanes—a charge Anscombe instantly resents. High over the mountains, an engine failure forces them to crash-land in the wilderness, and he and Tillie must learn to survive the elements, wild wolves, injuries and each other to make it home alive.